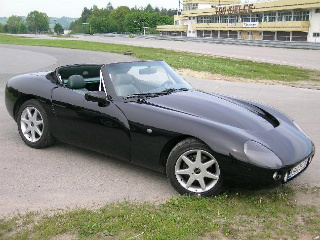 In 1991, the TVR V8S sports car was introduced, powered by the 3948 cc, Rover V8 engine. However, although it was produced up to 1993, it was overshadowed by the imminent launch of its successor, the TVR Griffith. With an eye to its predecessors, the TVR Grifith 200 and 400, spanning the period 1963 to 1967, the new variant was projected to be a fibreglass bodied, two seater convertible, sporting a V8 engine, and using the same chassis and running gear as the V8S. As TVR entered the 1990's, the order book was dominated by the TVR S, and customers made it clear that they wanted an even more powerful version. At the 1990 Birmingham Motor Show, the Griffith prototype was introduced, and was an instant success with 350 pre-production orders being taken. Using the strengthened chassis from the V8S, it was powered by a 4 litre, modified Rover V8 engine, with a body that was to become a design classic. Furthermore, the lack of any bumpers emphasised the body curves. Although the V8S chassis was sufficient to accommodate engines with an output up to around 270 bhp, a Griffith with a more powerful unit needed a stronger chassis. In 1991, TVR decided to use, in the new Griffith, the same chassis as that fitted in the Tuscan Racer, which had been shortened by 2 inches. This stiffer chassis could easily handle power beyond 270 bhp, since a Tuscan's output would exceed 400 bhp. Also, some additional design modifications had been achieved by this time. As a result, the re-jigged Griffith was unveiled at the 1991 Birmingham Motor Show, with the first cars being delivered in 1992, fitted with either a 4 litre or 4.3 litre engine. A combined total of 704 units, fitted with either engine, were built. Furthermore, there was the option of a 4.3 litre big valve version. On top of this, there was also a 4.5 litre variant, although only about 10 to 12 units were originally built, with some other versions being converted after delivery. However, within a year, the 5 litre variant became the sole choice. Launched in 1992, the new Griffith was initially powered by the same 4 litre engine as the V8S, which developed 240 bhp at 5250 rpm, and 270 ft/lbs of torque at 4000 rpm. In a redesigned body, and using a Lucas 14CUX engine management system, this meant that the car had a top speed of 152 mph, a 0-60 mph time of 4.8 secs, and a 0-100 mph time of 12.1 secs. Following its introduction, three quarters of the 1992 production was given over to the Griffith, when a total of 604 units were built in that first year. Since the new car was now cheaper than the TVR 400SE, this killed off any remaining demand for the wedge shaped models. 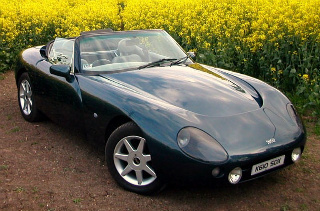 An early 1990's 4 Litre TVR Griffth in good condition would command in the region of £13,000/$21,000 to £15,000/$24,000, whilst a high mileage example would fetch around £10,000/$16,000.